King Denas is in trouble as his kingdom is under attack by vicious goblins, bandits, and even gruesome monsters. As the noble general of the kingdom, you are to lead your army fleet to battle the monsters in every region of the kingdom. 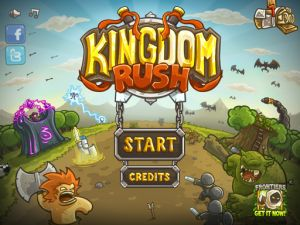 kingdom rush is a tower defense strategy game developed by Ironhide Game Studios. To succeed in every campaign, you will have to work with four types of towers which you must strategically place around the map. Aside from the four basic towers, there are also a total of eight tower Upgrades with unique abilities and strengths. The game also features around 30 unique Enemies with distinct characteristics and abilities that will have an effect on your Gameplay. No discussions open for Kingdom Rush at the moment.